The strong flat rack in this durable roaster is perfect for keeping meats elevated so that fat can drip away into the bottom of the pan. 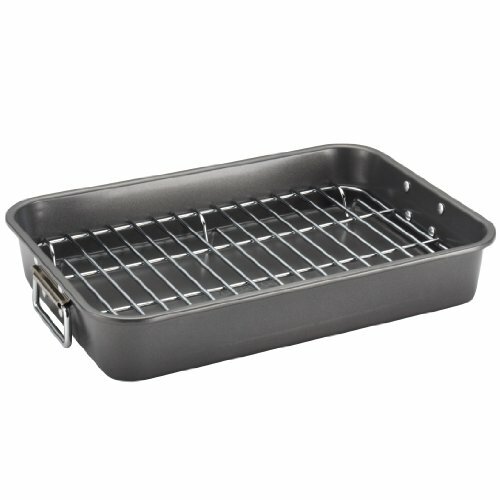 This roaster is ideal for pork, chicken and beef roasts and can also be used for vegetables and fish, too. Farberware Bake ware combines the durability and reliability everyday cooks require in their kitchen. This roaster is made of heavy gauge carbon steel that resists warping and features a sturdy flat rack so food sits up off of the pan and fats can drip away while cooking. This roaster is coated with nonstick on the inside and out so when the roasting is finished, cleaning up is always a breeze. This roaster is oven safe to 450°F.